While the Haunt Season means there are plenty of haunted attractions now open for visitors to get their thrill on, there are also many cities and towns in America that may put you in the Halloween mood, starting off with their name. These may be places great for visiting all year round, but it’s a particularly good time of year to visit now just given its name! Located in the southeastern part of Arizona, the City of Tombstone is also known as “The Town Too Tough To Die.” It’s known for its Wild West history and its one of the most authentic Western towns left in the country. While visiting you may also want to check out some of these events and haunted attractions. Yellville is in north central Arkansas and sits in Marion county. It’s home to a ghost town known as Rush, which was at the center of the mining industry in Arkansas and it’s also the final remnant of the Arkansas zinc industry. Today it continues to stand with the original buildings, mines and other structures. While visiting you may also want to check out other events and haunted attractions in Arkansas. Slaughter Beach is in the town of Sussex County, Delaware. The name itself is already causing some bone-chilling thoughts, but how the name came to be will depend on which story you want to believe. Some say it stems from the many horseshoe crabs that die on the beach each year. Others believe it’s based on the tale of a man from long ago who slaughtered Native Americans to prevent an attack on the early settlers in the area. While visiting you may also want to check out other events and haunted attractions in Delaware. 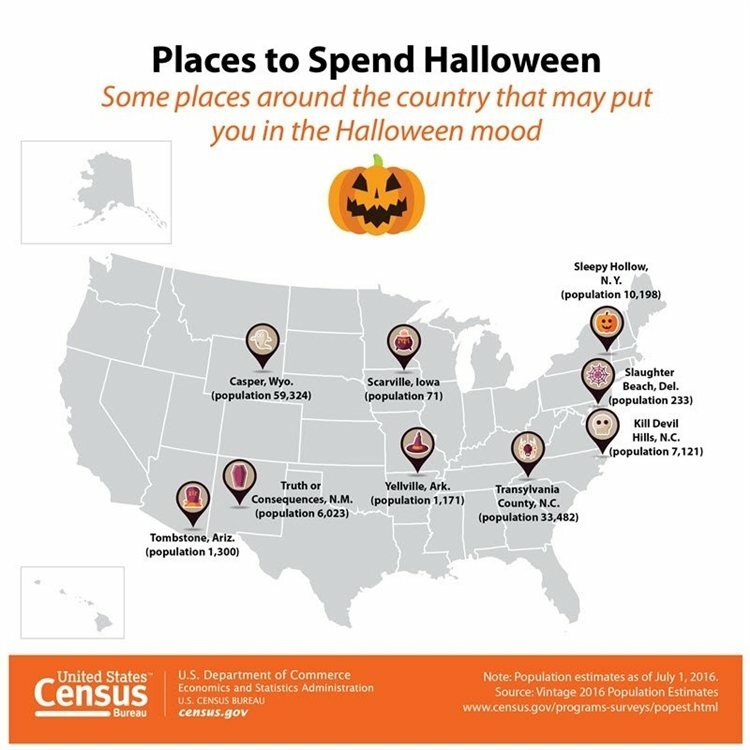 As much as we’d like to think of a place called Scarville as being a big scare village, it’s in fact a small town with an estimated population of about 70, according to the US Census Bureau. So if you’re scared easily, the name itself may do it for you. You can visit the nearby towns and cities in Iowa for events and haunted attractions, too! The City of Sleepy Hollow is located on the eastern side of the Hudson River. It’s known for its stories on mysterious hauntings. Washington Irving’s tale, “The Legend of Sleepy Hollow” was also set and written based on facts and tales from this haunted town, including that of the “Headless Horseman.” Washington Irving was later buried in Sleepy Hollow Cemetery. While visiting you may also want to check out other events and haunted attractions in New York. Kill Devil Hills is in Dare County, North Carolina. It is the oldest official town on the Outer Banks and it is home to the Wright Brothers National Memorial and a very much treasured beach. There’s also the Halloween International Film Festival that’s held here each year. While visiting you may also want to check out other events and haunted attractions in North Carolina. Transylvania County is in Western North Carolina. And, while it is known to many as the “Land of Waterfalls,” it is also known to have some strange tales. There’s the tale of the headless man on Williamson Creek. Visitors are advised to avoid walking along the creek or crossing the bridge at night for the headless man may be in search for his head. While visiting you may also want to check out other events and haunted attractions in North Carolina. Casper may be known by many as the friendly ghost, but in Wyoming it’s a central city in the state. Fort Laramie also has a long history here. At one time the fort served as a trading post and military fort. Many believe the fort is haunted by a legion of ghosts, including the Lady in Green who is believed to be the ghost of the post leader’s daughter who had gone missing after riding away on a black horse one day. Some say the outer grounds are also haunted by the apparition of a headless man and others. While visiting you may also want to check out other events and haunted attractions in Wyoming. Let us know in the comments below which of these scary-named places you’ve visited or plan to visit this Haunt Season just for its name!